When I was in India I bought two masala dabba boxes, one for me and one for Allison, my kitchen table friend! A masala box is a stainless steel tiffin with little bowls inside for holding your Indian cooking spices. One lid covers the whole spice box, so the aromas of the spices begin to mingle without actually mixing the spices together. This is the box I got for Allison. We stocked it at the fab little spice shop All Spice when I visited her in Des Moines a few weeks ago. Click here for a photo from our visit. Spices are (from top right): Fenugreek, mustard seeds, black peppercorns, ground turmeric, coriander seeds, cumin seeds, and fennel seeds (in the center). This is how I learned to fill a spice box from my cooking class with Anu in Mysore, India back in February. 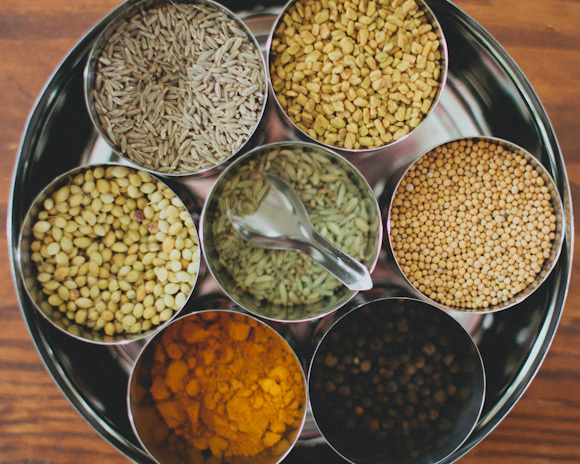 What to do with a masala dabba spice box? The Indian ladies keep it next to the pot and toss their spices in while the food is cooking. I'm not quite so adept at mixing spices in properly, so I like to blend spice mixtures together to use in my cooking. Below are a few of my favorite spice blends. These are all inspired by Ayurveda, the ancient Indian science of health and healing through the use of food, oils and spices. For all of the mixtures listed below, blend them together with a spice grinder or clean coffee grinder. Store in a small jar with a tight fitting lid. Spice mixtures lose their potency after about 30 days, so grind only as much as you need. This is a favorite homemade curry powder recipe from the Ayurvedic cookbook Eat, Taste Heal. I like to mix it into dahls and rice dishes, and spontaneous stir fries with coconut milk and veggies. This one is also from Eat, Taste, Heal. Its an easy kitchen staple for flavoring Eastern dishes. Its called Vata seasoning because it helps to balance excess Vata in the body. It's also delicious! This one comes from my Ayurvedic teacher, Kate O'Donnell. Mix it into into quinoa salads with fresh summer vegetables, olive oil and lemon juice. I hope you enjoy. And I'd love to hear how you like to use your spice blends!